The crossing had been rough, yet as soon as the ship had entered the harbor, the swell had abated. Although not prone to seasickness, Candice yearned for dry land: at sea, she could not fulfill her duties. All the dithering from Tampa to Key West to the Cuban coast had proved irritating. Caught between the conflicting orders of President McKinley and the military command, the Red Cross ship had been shunted from one seaport to the other, forbidden to unload either staff or equipment. Ever since she and Clara had watched the Maine founder in the port of Havana, she had understood that other men would soon need their help. The slaughter of civilians would be augmented by battles opposing rival armies. Their next patients would be soldiers wounded by bullet, saber, or shrapnel. In the United States, Clara Barton had collected donations in order to charter a civilian ship, the State of Texas. With a small team of nurses, she had loaded it with food supplies, tents, and medical equipment. As soon as General Shafter would allow it, they would put up a field hospital ashore and begin their work. The southern coast of Cuba was difficult to access. The heights of the Sierra Maestra, covered in greenery, sloped down to the sea; surrounded by rocks, the tiny beaches provided little shelter for sailing. Apart from Santiago, where Cervera’s fleet had found refuge, the calmest area was the bay of Guantánamo, located some sixty miles east. General William Shafter, who headed the American expeditionary force, had decided to install a rear base at that location to prepare a landing. The stillness of the water would allow the navy to transfer coal from its supply vessels to the holds of its ships. From this point they could strike Santiago and destroy the Spanish fleet, which Shafter hoped would end the war. He had no reason to think the temporary occupation of Guantánamo would persist into the twenty-first century. To defend the large bay, the Spanish army could count only on an antiquated warship armed with a light gun battery and a gunboat, the Sandoval. The ten-strong American fleet came forward to land several thousand soldiers. A few artillery shots promptly sent the Sandoval to take cover deep in one of the bay’s countless branches. The cannons of the Marblehead and the Suwanee then turned to the coastal artillery. Several abrupt explosions echoed in the hills. Two yellow curls of smoke slowly rose from the ground some distance from the fort, concealing them for a moment. Once the wind had dispersed them, the gunfire resumed, landing closer to its target. Finally, the fortifications were hit, but amidst the noise and dust it was impossible to ascertain whether the artillery was still returning fire. 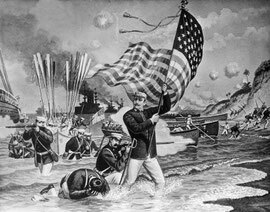 The ships continued their salvos, and for good measure, shelled the beaches and surrounding vegetation. The main result was to send the spectators, packed on the decks of the ships and ready to land, into transports of enthusiasm, for the defenders were gone: they had withdrawn to the garrisons lining the road to Santiago. On the State of Texas bridge, Candice had managed to obtain a pair of binoculars, a coveted object on this ship reduced to an observational role; the nurse had not secured permission to accompany the troops ashore. As she watched the coast, she failed to notice any human presence. Aboard the transports, however, feverish agitation reigned. The soldiers climbed aboard longboats that a steam cutter towed in the direction of the coast in groups of four. As the guns kept on pounding the nearby hills, a race began among these boats. Between the journalists’ ships, with the air of a summer regatta, the longboats rivaled each other amidst shouts of encouragement to win the title of the first unit to reach Cuban soil. After a long period of uncertainty, frenzied cheering announced the victory of Company D, the first battalion of Marines. The luckiest reached a nearby jetty and landed without so much as getting their feet wet. The others jumped overboard near the beach. Time would take care of hardening these men, who three months earlier plowed fields or drove cattle to town. For the moment, war seemed to them an invigorating hike, complete with swimming and picnicking. On the sand they lit fires over which they dried out their uniforms while stark naked. Salacious jokes rang out towards the Red Cross ship where they had spotted Miss Barton’s nurses, but the distance was such that their modesty did not suffer. Due to inadequate means of transportation, the number of animals was limited. Mules had been favored over horses, since their build allowed them to enter passenger ships. They were crucial to pulling the carts of an invading army. Under pressure from the yells and the lashes, they were thrown in the water, where sheer instinct pushed the luckier ones to swim to the shore. The carcasses of the other mules would emerge in the coming days, slumped on the beach or torn into shreds by the coral reefs. A mule set out for the State of Texas, on the other side of the beach. She was doubtless a leader of sorts among her kind, since some twenty other animals followed her towards the sea. Muleteers are known to be resourceful, but overseeing a flotilla of mules in water is not part of their training. A bugler did think of sounding the order commonly used to direct a convoy towards the right. The leading mule obliged by turning right, obediently accompanied to the shore by its cohort of followers. Reflecting the buoyant mood of this festive day, the beach and the ships burst out in applause. Once darkness had fallen, the men who had not disembarked began their seventh night aboard what they called their floating prisons. No one slept. In the absence of alcohol, the thought of the next day’s dip upheld the excitement and lessened the frustration of not being ashore. In one ship, a voice intoned the song The Girl I Left Behind, picked up in unison by everyone on deck. On the neighboring ships, between the moon’s pale glow and the reddish sparks of the campfires on the beach, other songs rose into the night. Ah, wasn’t war splendid? Early the next morning, Candice was leaning on the railing of the State of Texas anchored next to a small beach away from the transports. The soldiers of Company D had left the tents strung out by the dozen over a strip of land separating the sea from the mangrove swamp. Taking only their rifle, they had walked all the way to the sand beach a half-mile away, and enjoyed a morning swim, ahead of a difficult day that would be spent teaching democracy to Spanish colonialists. A volley of gunshots suddenly burst from the forest. Panic-stricken, the men rushed to their weapons, close to the same grove whence came the detonations. In their defense, it must be said they had experienced gun firing only at drills. They were taught that shooters could be spotted by the white smoke caused by the source of the shot, yet no one had mentioned that the Spanish army used smokeless Mauser rifles. From the ship’s deck, Candice discerned the small water sprays raised by the balls ricocheting around two corpses floating in the waves. Above her, the young woman heard a few stray bullets whose hissing seemed quite harmless, yet they would provide her with her first patients. Two more soldiers fell before a counterattack could be arranged. Under the command of a sergeant without his stripes, twenty naked men deployed in a semicircle and disappeared in the forest. For a moment, Candice saw none of the fighting taking place under the trees. She heard the cracks of hundreds of rifles and the bangs of the revolvers, followed by the roar of naval guns coming to the rescue. When the men had overtaken the edge of the trees, Candice saw them again running up a hill and stopping irregularly to fire. A speck of smoke rose before the soldier would set off again. She could observe the pale backs and white buttocks of the swimmers from Company D alongside those in uniform. The soldiers stopped just before the hilltop. They feared that on the skyline, they would be easy targets for the enemies lying in wait for them on the other side. To dislodge them, the captain once again summoned the naval artillery. But he had to disclose promptly and precisely the place to shell. A soldier rose over the crest of the hill, revealing against the sky a silhouette perfectly noticeable from the ships. Standing squarely with his legs wide apart, he proceeded to send a message to the ships using flag signals. The square-shaped fabric began to dance slowly around him. Hundreds of eyes were fixated on this lone man: with the same serenity Socrates displayed as he drank the hemlock, he was willing to perish as he fulfilled the task he had learned at Signal Corps training. The American side ceased fire and held its breath. The man was surely just as visible on the other side, for the Mausers' stifled gunfire was audible from the hidden slope of the hill. The Spanish shooters had made him their targets; the upwards-pointed bullets passed high above the ships before fading in the sea. Inexplicably unscathed, he was seen – bold or foolhardy – coolly strutting down to a hollow in the ground, his flag rolled up below his arm. Immediately, a volley of shellfire from the Marblehead crashed on the position whence the shots had come, behind the hilltop. The combatants resumed their advance and disappeared from Candice’s eyes. A week later, the Red Cross ship was still anchored in front of Guantánamo. The transports followed one another in the bay where they dumped their share of soldiers and set off again to Tampa for yet another trip there and back again. For lack of suitable infrastructure, unloading the equipment was more problematic than disembarking the troops. The chaotic result at the front of the beach was one in which thousands of men struggled among dozens of ships and hundreds of boats. The highest-ranking and smartest managed to push past the queues to bring ashore soldiers, and whenever possible, tents, food supplies, rifles, cannons, mules, ammunition, and carts. And what about the medical supplies? Candice thought. They had been appropriated and loaded in Tampa, but the bulk of the supplies remained aboard as the army had more pressing concerns: foremost was the matter of the capture of Santiago. In any case, the wounded were few and the dead even fewer. The young woman strove to remain philosophical, noting her plight was no worse than those of the men near the beach waiting their turn to disembark. Yet were not some of these faraway shots fatal? What about these monstrous explosions, whose purpose was to shred and mutilate, shaking the cruisers when they bombed invisible targets? Was it not absurd to condemn the nurses of the Red Cross to idleness when they could alleviate suffering and save lives, even Spanish ones? A steamboat pulled away from the Marblehead and headed for the State of Texas, winding its way between the ships. The tone betrayed the officer’s embarrassment, for he was speaking to civilians, considered of minor importance in the eyes of his superiors, yet he knew himself to be in the presence of a famous person respected throughout America. Having reached the accommodation ladder, he rendered the salute towards the stern where the American colors, the Stars and Stripes, were flying. “It seems that Colonel Roosevelt’s Rough Riders were caught up by the enemy some thirty miles west. Here, in Guantánamo, you’ll be hard pressed to find mules to carry your equipment. If you land in Daiquirí or Siboney, you can set up your hospital very close to the fighting. It’s probably more dangerous for your crew, but you’ll be able to get to work by this afternoon.” With good reason, the officer was unknowingly initiating a policy which would endure for more than a century, that of keeping civilians away from Guantánamo. The officer’s advice proved sound, for in a few days, nearly sixteen thousand troops had landed on the beaches east of Santiago. 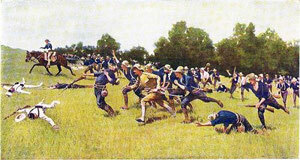 Overcrowding was worse than anything they had experienced in American training camps at Tampa, Chickamauga, or Jacksonville. By contrast, Siboney’s beach was close to Las Guásimas whence the wounded began to pour in. They were grouped in two buildings near the sea: one housed the Americans, the other the Cuban rebels. On both sides, the absence of supplies was striking. The men were laid directly on the floor, their wounds covered by a piece of cloth torn from a uniform. The doctor’s equipment was limited to whatever was in their pockets upon leaving the ships: no operating table, no disinfectant, not the least surgical instrument. The nurses paced around the wounded, unable to offer any comfort save reassuring words. Flies made the rounds as well. Above them hovered great black birds, oscillating to the rhythm of the tides. For hours on end, they outlined circles without a flutter of their giant wings spread in a wide open “V.” The silence of their movements overhead was comparable to that of their shadows slowly gliding on the ground. When airborne, they moved majestically, with a grace emphasized by their quill feathers delicately rolled up. Yet when they perched, one could hardly imagine so stark a contrast. Up close, their wrinkled, ruddy heads made them look like deliberating old-timers. Their beaks were so pale they could be mistaken for a whitened bone protruding from the throat. Their nasty little eyes betrayed what frustration stemming from their vulturine existence. Thus some species arouse revulsion: cockroaches, tarantulas, centipedes… and urubus. The Cuban insurgents were used to frugality, even destitution. They probably understood much more than Dr. Winter that the care, supplies, and staff of the Red Cross would mean for them the difference between a fatally wounded soldier and a soldier who could return to the front lines. They gratefully accepted the proffered assistance. The next day, an unexpected segregation developed: on the Cuban side, the building was disinfected, the wounded fed and tended in beds, the operating tables in operating condition, the mosquito nets hanged. On the other side, the Americans continued to suffer, still on the floor, in need of care, waiting for a troublesome evacuation on a hospital ship. The village of Siboney, with little more than some fifteen houses, swarmed with thousands of people. American troops were joined by General Máximo Gomez’s Cuban rebels. Moreover, hundreds of starving civilians had converged upon the beach, drawn by the occupying forces’ convoys of food supplies. The crowd was such that it became obvious how difficult it would be to transfer the wounded to the coast. George Kennan was a fervent advocate of the American Red Cross. A writer and journalist by profession, he had been sent to Cuba by Outlook magazine to describe the truths of the reconcentración and cover the war. He had boarded the State of Texas and had acted as the organization’s unofficial representative whenever a male presence was needed. As for Candice, she was happy to have George and Clara at her side to learn about war. She knew her first few days ashore would be the most difficult.